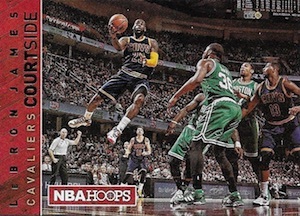 The first official NBA product of the year, 2015-16 Panini NBA Hoops Basketball continues the popular low-end line with the earliest chance for collectors to find pack-pulled rookie cards from the 2015 NBA Draft class. This includes top picks like Karl-Anthony Towns, Jahlil Okafor and D'Angelo Russell. Each hobby box yields two autographs. 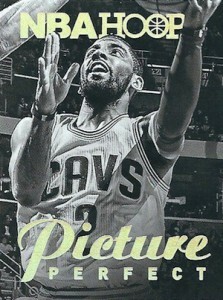 The simple base set focuses on action photography set inside a framed white border. 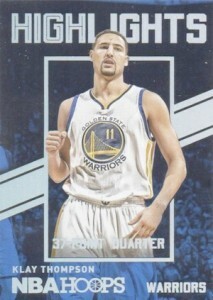 Like previous years, rookie cards are part of the base set. 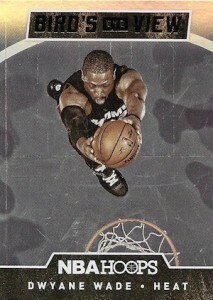 Although specifics are not known, parallels are also available for the base set. Offering some of the first signed cards for the newest rookies, Hot Signatures features a red color scheme and sticker autographs. Collectors can also find limited Red Hot Signatures parallels. 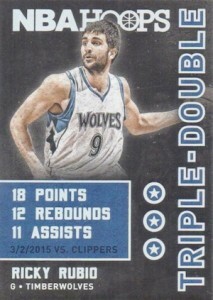 Inserts are heavily featured in 2015-16 Panini NBA Hoops Basketball. Highlights cover notable performances from the 2014-15 season. Bird's Eye View includes unique images that feature on overhead vantage point. Triple-Double honors noteworthy player production from the year. 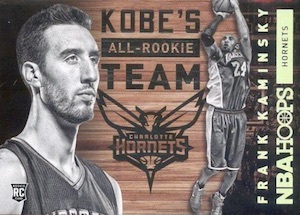 Other options include Kobe's All-Rookie Team. Broken into multiple tiers that become increasingly more rare, Road to the Finals is basically an overview of the 2015 NBA Playoffs. Each round is covered from the First Round until the NBA Finals. 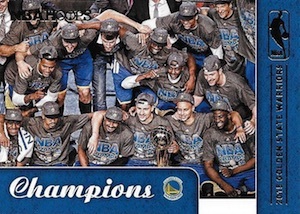 The most limited cards are Champions short prints that celebrate the title-winning Golden State Warriors. Any idea on the size of the set? Still 300 cards or bigger or smaller? 3 insert sets is a big reduction from 13 last year. But if there is only 1 insert per box it will still take several boxes to get them all. Sounds to me like a token offering to keep the name alive, while they focus on their other 15 or 20 higher-end NBA lines. Disappointed. 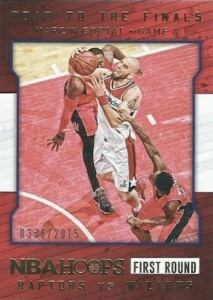 Dave � Panini only released very basic info about the set. I imagine there will several more inserts than what is currently listed. Since there are 20 inserts/parallels per box, the amount of inserts will definitely be higher than one per box. Sorry I meant to write pack not box. Will there be the typical blaster boxes for us less wealthy collectors to purchase at our local supermarkets (Wal-Mart, Target, etc)? Devin � I have not seen anything specific yet but I imagine there will be retail options. i gave a 4 star for a low end product. Plenty of cards for the money. Looks better than previous years and the autograph checklist seems to have improved as per autos per team and qualty of players. its the only basketball product i look forward to every year. Bought 2 boxes today for $60 each. 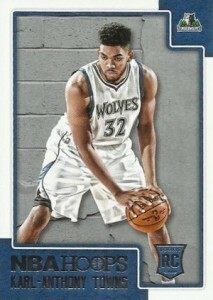 Love the design of the rookies and insert cards. Not too many inserts and you get 2 autos per box. I didnt pull any big name autos, but I did get an Anthony Brown Auto for my PC. I completed the 300 card set with 2 boxes. Take the box seriously when it says “two autographs on average.” I hope someone out there enjoys their 3-autograph box, because we only got one in our box today. And it was Jordan Clarkson at that. So from that standpoint, the purchase was a waste of $60. The inserts and numbered cards, however, came up good in terms of player content, and there were no doubles, so that’s a positive. But if it’s that hard to regulate your autograph content per box, don’t advertise it and let people be surprised, or shore up your operation. Bush league stuff by Panini. Thankfully, we are close enough to a complete set that there’s no need to waste money on another box. I can’t believe what people paid for the porzingis auto at the start of the product coming out($31-$71) and now what they are asking after they get them($300)! Don’t get me wrong he has potential but it seems like he has one good game then a dud. I know he’s young and has so much room to grow but are his autographs that sp? I guess are the rookie autos that sp period? 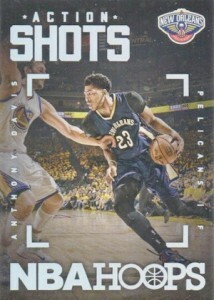 Hoops very slow (1 month after release date) to get first basketball product to your local Target or Walmart retailer. Bought 2 110-count boxes, 22 rookies total. 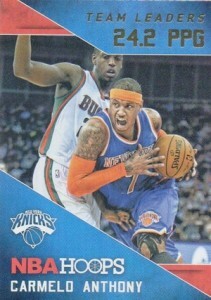 Interesting fronts, but back of cards should be white with black lettering. Tough to get players you’re looking for; you might have to shop several sellers on Ebay to complete your wish list. Porzingis is the toughest rookie to find. This is a great entry level product which IMO is better than some of Panini’s higher priced sets. is awesome. The gold parallels are beautiful and should be numbered. The rookie content is great but the sticker autos are still bothersome. But for the money overall its a good product, I bought several boxes. 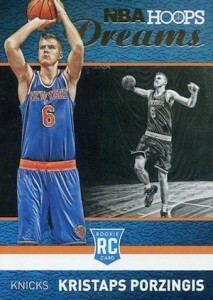 2015 16 Panini HOOPS BASKETBALL Hobby Box - PORZINGIS TOWNS RCs! 2 AUTOS BOX!! !